Everyone who’s been through a few years in college knows just how expensive education can be. Looking for an affordable, quality program is one of the prerequisites for starting your career without accumulating too much debt. Are you considering a career in the field of X-ray technology? If so, the following list will give you ideas about 10 inexpensive educational opportunities that will result in a bachelor of science degree upon the completion of the program. This university features the most affordable prices for a four-year radiologic technology program. The in-state tuition cost is 14,039 dollars and the total cost for out of state students is 22,375 dollars. For more information about tuition costs and the curriculum of the program, visit the University of Arkansas Fort Smith official website. The four year program results in a bachelor of science degree in radiologic technology. The tuition cost for in state students is 15,073 dollars and out of state students will need to pay 27,231 dollars. On top of having an excellent campus-based program, University of Louisiana Monroe is also known for its online degree platform. The program is great for individuals that would like to complete the program at their own pace without having to attend classroom activities. The in state tuition fee is slightly higher than what University of Louisiana Monroe students have to pay – 15,170 dollars. The out of state program’s cost is 26,397 dollars for the completion of a four-year bachelor of science program. The radiologic sciences curriculum is truly comprehensive and it gives students both the theoretical and the practical skills needed for successful career establishment. The four-year program at University of South Alabama will cost 15,488 dollars for the in state students and 22,376 dollars for the individuals wishing to enrol in the out of state program. University of South Alabama’s website features all of the essential information about the courses and the tuition fees. The bachelor of sciences in radiography program consists of various practical courses like radiologic technology introduction, radiographic procedures, terminology, radiologic pathology and physiology, contrast agents and radiographic procedures. The program cost for in state students is 15,872 dollars and for the out of state students – 22,532 dollars. In state students will need to pay 16,327 dollars for a four-year BS in radiologic technology. The cost for out of state students wishing to attend Midwestern State University is 18,277 dollars for the entire program – one of the lowest in the US . Moving on to slightly more expensive programs, Northwestern State University of Louisiana has a bachelor of science in radiologic technology that costs 16,460 dollars for in state students and 27,248 dollars for the out of state participants in the program. People that would like to obtain a BS degree in radiologic technology from North Dakota State University should be ready to spend 16,542 dollars on the in state program and 27,553 dollars on the out of state program. More information about the courses and the curriculum can be found on North Dakota State University’s official website. Marshall University takes the ninth position in the chart of the most inexpensive X-ray technician schools. In state students that would like to complete the four year program will need to spend 17,172 dollars. The out of state tuition fees for the four years of education will add up to 25,672 dollars. The final university included in the list is Oregon Institute of Technology. Apart from having one of the most affordable program, the university is also recognized for the quality of its radiologic technology degree. In state students should be ready to spend 18,577 dollars and the out of state program costs 33,802 dollars. The slightly more expensive prices are justified by the completeness and the practical appeal of this educational opportunity. Don’t want to pursue a bachelor of science degree in the field of radiologic technology? The tuition fees still seem to be too high? In this case, you may want to look at some of the colleges that have affordable associate’s degree programs. 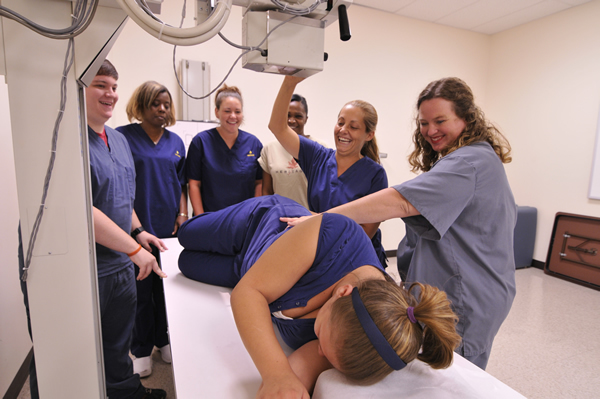 Some of the most inexpensive opportunities for people interested in becoming X-ray technicians are provided by Gadsden State Community College (7,868 dollars), Southern Union State Community College (9,496) and Jefferson State Community College (15,534 dollars).